BELLEVILLE – Parents across the province will be receiving more support through services that provide early child development programs, according to Hastings County Children’s Services. Ontario Early Years, which will be renamed EarlyON in the new year, will offer group activities for parents, grandparents, caregivers and children under six to further early learning and social development, according to Beverly Bell-Rowbotham, data analysis co-ordinator for Hastings County Children’s Services. There are four programs offered through Early Years. Hastings County offers two of the four – Ontario Early Years Centres and Child Care Resource Centres. However, in the transition to EarlyON, two programs will be added. “Here we did not have Better Futures and Better Beginnings, and we didn’t have the Parent and Family Literacy Centres. The (Ontario) ministry (of education) wanted to bring all of those programs to make it more clear for parents and to make it more efficient and effective,” said Bell-Rowbotham. Ontario Early Years focused on children’s development, but EarlyON is going to be supporting parents and caregivers more. EarlyON is going to make sure parents and caregivers are aware of the services and organizations that are available to them, said Bell-Rowbotham. “Parents want to be good parents; how do we support them in doing that? … How do they get to be the best parents that they can be?” she said. Some of the changes proposed for the new year are a result of concerns and comments registered in surveys and focus groups of parents and caregivers. In Hastings County, 860 people filled out the surveys and 194 community members participated in over 40 interviews and focus groups, according to the Ontario Early Years service plan for Hastings County. One of the concerns raised was the times in which the programs are scheduled. Another concern was the lack of programs for Indigenous families who don’t live on reserves. In North Hastings, one in eight children aged four and under is Indigenous, Bell-Rowbotham said. 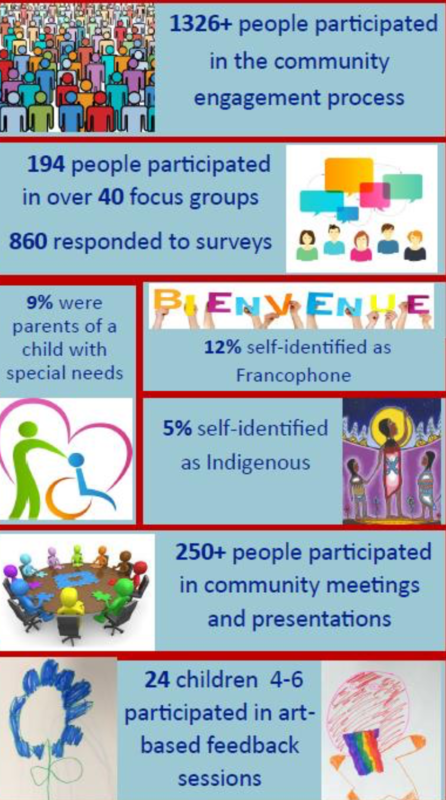 There were also few programs for francophone families. According to the Ontario Early Years service plan for Hastings County, there are more than 150 children under six who are francophone in Quinte West, home to Canadian Forces Base Trenton. The education ministry realized that bilingual environments are not the same as francophone environments, Bell-Rowbothom said. The EarlyON transitions in Hastings County won’t be finished until July 1, 2018, because Hastings County Children’s Services has to go through an identification process to find lead agencies to host the new programs.